I created this card for yesterday’s Free 4 All Challenge. Jeanne asked us to created something with a blue flower. I love this rose image from JustRite Stampers new With Sympathy stamp set and thought they would look good in blue. The image was stamped in Tuxedo Black Memento Ink on a piece of My Mind’s Eye Be Amazing patterned paper. The image was cut out with a Classic Square Nestabilities die and the Out of the Box technique and colored with Copic Markers (B0000, B91, B95, G20, G21, G24, G28. YR30). One more rose bud and a leave branch were stamped on a scrap piece of the same paper, colored and cut out. The square was sponged with Antique Linen and Vintage Photo Distress ink and the edges were stitched. The square was adhered to a piece of white cardstock, cut and embossed with the largest of the Fleur De Lis Square Nestabilities dies. A piece of Be Amazing paper was cut and embossed with a Grand Square Nestabilities. The edges were sanded and stitched and a piece of Light Blue Organdy Ribbon was tied around the paper vertically. The image layer was adhered over the paper and ribbon and a button was tied over the bow. The paper was adhered to the card base, Neenah Solar White cardstock, cut and embossed with a Grand Scallop Square Nestabilities die. A sentiment from Fleur De Lis Label 20 stamp set was stamped on a piece of white cardstock, cut and embossed with a Standard Circle Nestabilities die. The edges were sponged an a leave from the image was stamped in the center with Antique Linen ink. Fancy That! Border Bling on the top right of the image corner and three small Rhinestones under the sentiment finish off the card. 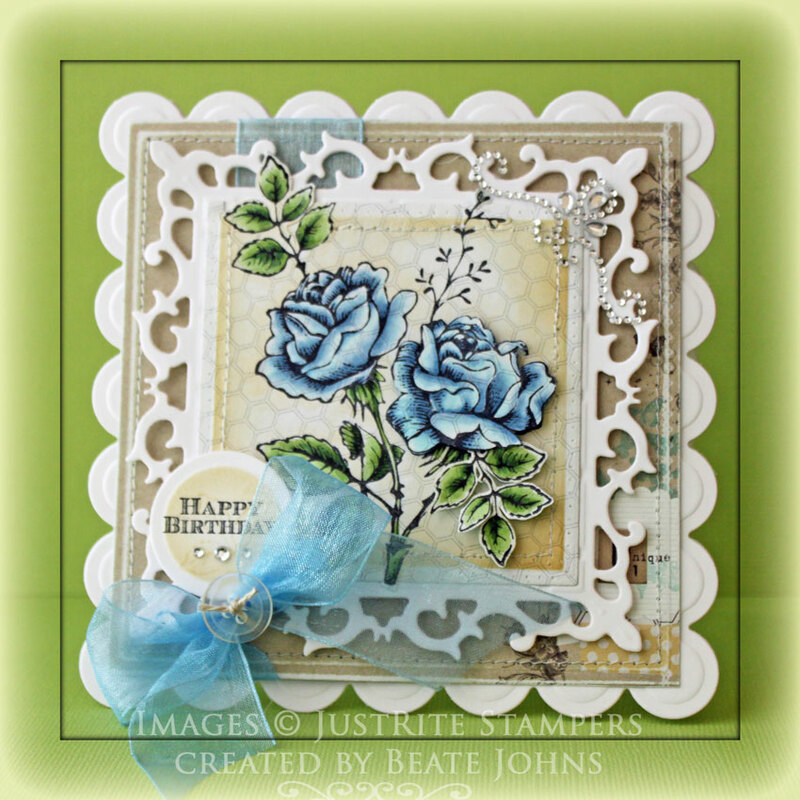 I made it into a birthday card so I can enter it into the current JustRite Stampers challenge Birthday Bash. Beautiful! I’m always inspired by your coloring. WOW Beate, what stunning blues on the roses. Love the soft palette too. Stunning card Beate, love the coloring job you did on these flowers, just awesome!! Very pretty finished product!! 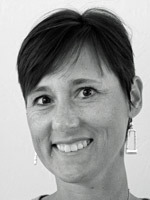 Beate – Thank you for so consistently taking your time to create these wonderful Blogs. I really enjoy and find incredibly useful, the detail you provide in your attached tutorials. You convey the ease with which we can make this and other cards/projects you create ourselves – Thanks it’s a great confidence booster. Stunning! I love everything about it! This is breathtaking! Love the depth and colors of the image. Beautiful work, Beate. Hi there Beate ! This is so very stunning that I had to print it out, so I might use it for CASEing in the future…I just love the shade of blue you used and the design is too perfect! I miss my time blogging, but I still make cards for my friends at work and for the friends who have retired. Again, another beauty from you and another inspiration for me…Thank you my friend! So much work and so worth it … beautiful. This is a really beautiful card, Beate. I think it’s my favorite that you’ve made. I love blue and tan together and the layering is gorgeous! Beate, this is gorgeous! LOVE the blue roses, they are coloured beautifully! This is just so lovely. What a beautiful dreamy quality it has, you are just amazing! I love this card. This is stunning Beate!!! Love the beautiful colors you used to color that gorgeous stamp!!!!!! they are gorgeous in blue! beautiful card, Beate! Zauberhaft, unglaublich schön. Die Karte ist ein SAHNESTÜCK !!! Stunning, love the coloring here and the background for it is so cool. Your corner bling works perfectly with the framing… Gorgeous! WOW! Another AMAZING creation! Beautiful coloring! This is stunning. Love the colours and your colouring is amazing as always! I really love this card, especially the roses, they are stunning in blue. Such a lovely composition. wowwwwwwwwww ! Beate i love love love love this card !